FOR IMMEDIATE RELEASE . . . August 30, 2011 – Santa Ana, California – Over 100 people in need were served a nutritious lunch by three generations of the Dominic Corea family, owners of the legendary ROMA D' ITALIA ITALIAN RESTAURANT AND PIZZA. 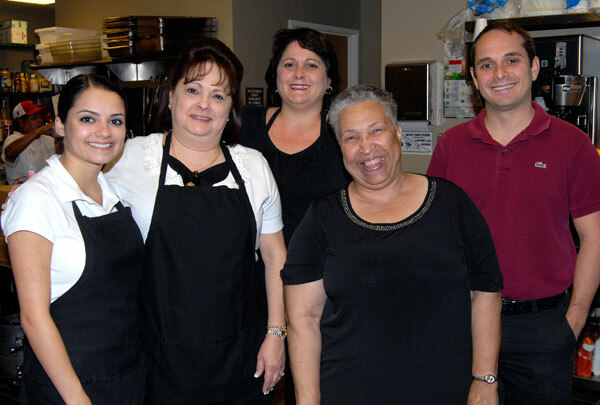 82 year old Matriarch Nina Corea, along with her two daughters, Tina Rossetti and Teresa Golka, second generation owners, and grandchildren Alfio Rossetti, Victoria Rossetti, and Anna Golka, representing the third generation of ownership, were on hand at the Smeda Soup Kitchen in downtown Santa Ana to serve lunch. The Smeda Soup Kitchen, housed at the Southwest Community Center, has been sharing, caring and giving for the past 39 years to people in need in our community. Southwest Community Center provides food, clothing, shelter, guidance, health, and referral services to economically disadvantaged individuals and families, and assists and encourages those who they serve to achieve self-sufficiency. Presently celebrating its 50th Anniversary in the Tustin location, Roma D' Italia Restaurant and Pizza just completed a major remodel last year of its flagship restaurant, which now boasts cocktails, in addition to a warm and inviting private Banquet Room for that special family occasion or business event. "Today is very special for us to give back to our community who has supported our business over the last 50 years," stated Nina Corea. "Our family is delighted to have this opportunity to serve these individuals who need our help. Our restaurant has always been a labor of love for my children and now their children, and it makes me extremely proud to realize what we have accomplished, " Corea continued. Roma D' Italia Italian Restaurant and Pizza was Tustin's first and original family-owned Italian Restaurant. Lovingly referred to as "The Roma", this restaurant has been an institution in the City of Tustin. In the early days, it began with one dining room seating 36 guests, and now boasts three expansive, family-friendly dining rooms. Today, the recipes of matriarch Nina Corea still prevail. When Dominic and Nina Corea purchased the restaurant, they began with a simple menu of spaghetti and meatballs, in addition to pizza as their main staple menu items, utilizing top-notch ingredients. With their attention to detail always at the forefront, the menu has grown to feature a variety of appetizers, specialty seafood, a variety of pizza and pasta dishes, veal and chicken entrees, and a continuously growing wine list. Their lunch and dinner offerings are always tasty and expertly prepared fresh daily. Since daughters Tina and Teresa have been managing the restaurant for the past 20 years, they have gradually added their own flavors to the long-running menu favorites. Even their homemade desserts, such as their acclaimed Tiramisu, Rum Cake, and Cheese Cake hit the sweet spot. "When our family reflects back over all those years, we realize we still have some of those same customers today who really love what we do," stated second generation owners, Tina Rossetti and Teresa Golka. In 2010, the Dominic Corea family decided the time was right to open a second restaurant in the City of Orange. This quaint location, across from CHOC and St. Joseph Hospitals, reminds many of their loyal customers of their early years at the Tustin flagship location. Open for lunch and dinner, offering Dine In or Take Out, this second location's full menu features a variety of salads, hot and cold sandwiches, chicken, sausage, seafood, signature pasta dishes, homemade soups, their infamous pizza selections, and specialty breads.